Hi, I’m Capt. Brian Morris. My family and I live on Coronado Island here in beautiful San Diego. I grew up on the Outer Banks of North Carolina and currently hold a 100 Ton Masters License. I’ve been saltwater and fresh water fishing since my early childhood. Fishing and hunting have always been a way of life for my family as well as my home town. It was in North Carolina where I learned to fish for anything from largemouth bass in tributaries of rivers, sounds, and swamps to chasing pelagic fish such as grouper, tuna, dorado, wahoo, marlin, sailfish, and swordfish in the Gulfstream. After high school, I joined the US Navy and reported to my first duty station here in San Diego. It was in the Navy that I found a love for traveling the world, learning about different species of fish, and cultural diversity. 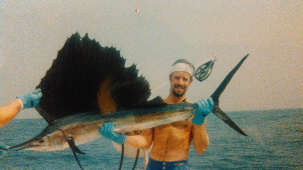 After the Navy I moved back to Cape Hatteras, NC aka “World’s Blue Marlin Capitol” to commercial fish and sport fish. I then followed my love of the sea to commercial fish in Alaska and spent almost a decade as a merchant marine. As a merchant marine I embraced the opportunity to learn everything I could about ship navigation and boat handling in various sea states on many different types of vessels. People used to think I was crazy for trolling lures off the stern of an 800 foot container ship or from a rolling sea tug. It paid off many times! Some honorable mentions include pacific sailfish off Okinawa, wahoo and tuna in the Micronesian Islands, tuna and Vermillion Snapper in and around the Panama Canal, and hand lining tuna from a research vessel off the Azores. Now, I’ve been fishing solid throughout southern California for 12 years mainly in San Diego and Baja Norte. 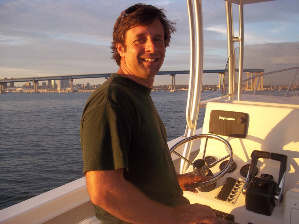 If it’s fishing Catalina Island, Coronados Islands, the offshore outer banks of southern California and Mexico, or the coastal kelp beds and bays, I’m on it!